Many important public policy debates are centered in the nation’s state capitols—particularly with gridlock often gripping the U.S. Congress. In fact, nearly half of the state legislatures (24) enacted more laws in 2012 alone than Congress did in 2011 and 2012 combined. 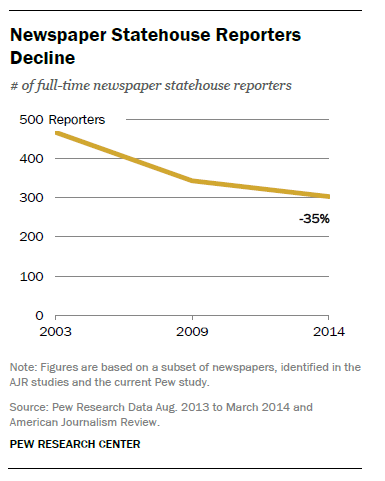 1	Newspapers have more journalists in statehouses than other media do, accounting for 43% of the full-time reporters. But those ranks have been thinning. An examination of comparable newspaper data from 2003 to 2014 finds that the number of full-time statehouse reporters dropped by 35% between 2003 and 2014—a loss of 164 jobs. A number of observers say this has led to diminished coverage. 2Some reporting losses in statehouse news coverage have been made up for by nontraditional players. In total, 126 full-time statehouse reporters work for nontraditional news outlets , which include nonprofit and commercial digital news organizations, ideological outlets and government insider publications that can charge steep subscription fees. This nontraditional sector accounts for 17% of all full-time statehouse reporters in the U.S. In seven states—Connecticut, Michigan, New York, Ohio, Tennessee, Texas and Vermont—the outlet with the largest number of full-time statehouse reporters is one of these nontraditional organizations. 3	Statehouse reporters are fairly evenly split between full-time (741) and part-time (851) workers. Most of the journalists who are at the statehouse less than full time are assigned there only for the length of the legislative session or part time. While more than half of the total newspaper, radio and wire service reporters at the statehouse are full time, only one-third of television reporters in the capitol buildings (88 of 263) are sent there on a full-time basis. 4	On average, there are 15 full-time reporters working in each statehouse, but the total varies from state to state. The largest full-time contingent (53 full-time reporters) works in Austin, Texas, followed by 43 full-timers in Sacramento, California. Conversely, the state with the fewest full-time journalists at the capitol is South Dakota, with only two; one of them works for the Associated Press and the other writes for six newspapers. The Pew Research study found a clear correlation between the population of a state and the size of its statehouse press contingent. 5	One in every seven statehouse reporters today (or 14% of the total) is a college student. In all, 223 students are assigned to state capitol buildings, although they are usually there part time and for short tenures. Of that contingent, 97 students work for legacy news organizations such as newspaper and broadcast outlets, and 126 work for other outlets, ranging from school publications to nonprofit news organizations. In a shifting statehouse news landscape, students may also be compensating for some of the legacy reporting cutbacks.